Fire Codes: Gotta Love Them! In the aftermath of the Grenfell Tower fire in London, many people have asked me if this could ever happen in the US. Of course, tragic fires happen frequently in the US, about 3,000 people die in fires every year, versus a few hundred in Britain. Some say that the British focus on building to building fire spread has blinded them to the urgent need for a focus on fire spread within a building. 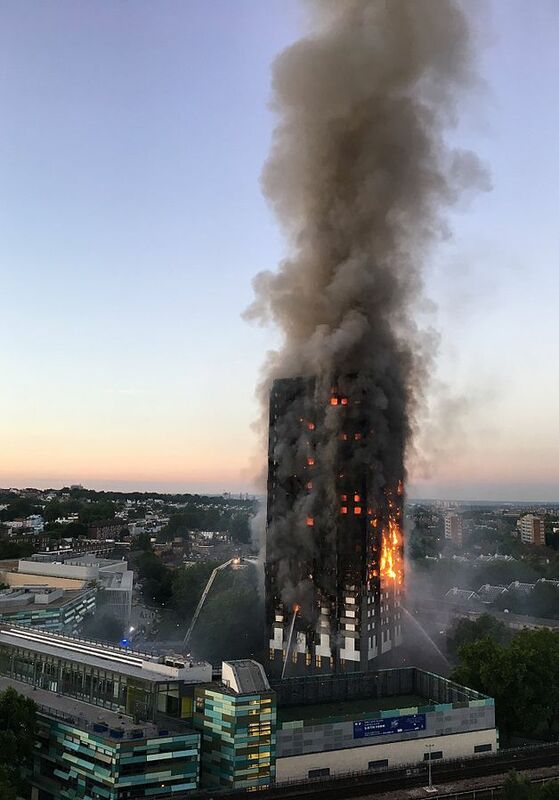 Right wing politicians in Parliament have fought any increase in requirements for the use of non-combustible building materials as unfair to building owners. The Grenfell Tower sub-contractor who installed the combustible aluminum sandwich cladding (a non-combustible version is available and required in most countries on buildings over 2 stories high) claim that they didn't know that they were installing the cladding, which they knew was combustible, over a combustible insulation material. They assumed that the insulation was non-combustible. So, the combination of combustible insulation, combustible cladding and an airspace behind the cladding allowed the new façade not only to combust, but also to spread the fire around the outside of the building. The Grenfell Tower building was a concrete structure (often called “Brutalist” style) that naturally prevented floor to floor and unit to unit fire spread. Without the new cladding and insulation, the fire in the fourth-floor unit might have been contained in that unit, sparing at least 79 residents. A very good accounting of the post fire analysis by the New York Times is available here. Apparently, manslaughter charges will be brought, although the article doesn't specify against whom. When I first heard that the public housing building was unsprinklered, I thought that the government should have invested in sprinklers instead of a new façade. Now that I have more information, I realize that the concrete structure would have made the need for sprinklers feel less pressing. However, I was amazed to learn that the building only had one stairwell! In the US, we have had a requirement for two means of egress for almost ever! Two stairs might have also saved more people. Of course, sprinklers might also have saved lives, quenching flames as they entered each unit from the outside. The smoke from the combustion of the materials also contributed to loss of life. In the US, we have the NFPA, the National Fire Protection Association, funded primarily by insurance companies. The fascinating requirement of the NFPA testing is that they require a test of all assemblies. This means that not only the materials need a fire rating, but also, the proposed assembly of materials needs to be tested to determine their performance as an assembly in a fire. Had the testing of the Grenfell Tower exterior cladding been performed according to the NFPA standards, it would have been rejected as hazardous. So, US building owners, please don't complain when you are required to pay for an assembly of the proposed exterior design to meet the NFPA and code requirements. Please don't complain when you are renovating an old building and the amount you spend triggers a requirement to bring the building up to current codes. The lives you may save are priceless!